At it's Build 2016 developer conference, Microsoft surprised everybody with the announcement that it is bringing the Bash shell, a command line tool used in Unix-style operating systems like Linux, to Windows 10. The company has been showering Linux with love recently but this is a great leap forward for Microsoft in supporting open source development. Running Bash on Windows was possible in the past using third-party solutions, but there were a number of limitations. Now Microsoft is allowing Bash to run on Windows 10 natively; without the need for virtual machines or emulation. Microsoft has partnered with Canonical, the company behind the Ubuntu distribution of Linux, to make this a reality. The Ubuntu OS is also being brought over to Windows 10, running on a foundation of native Windows libraries. So what does this mean for developers? For one, if you're a developer that uses a wide range of Linux tools, being able to use the Bash shell is a godsend. It brings a sense of familiarity, allowing you to write your Bash scripts directly on Windows. Note that this isn't about Linux Servers or Server workloads. This is a developer-focused release that removes a major barrier for developers who want or need to use Linux tools as part of their workflow. Conversely, it opens doors for developers who want to dip their toes into Linux operating systems through Bash. By bringing Bash and Ubuntu to Windows, Microsoft has firmed up its position to support other platforms. It's all part of its efforts to make Windows 10 more attractive to developers. Judging from the rapturous applause the announcement received at Build 2016, we'd say Microsoft is heading in the right direction. You can also read up on other announcements from Build 2016 here. 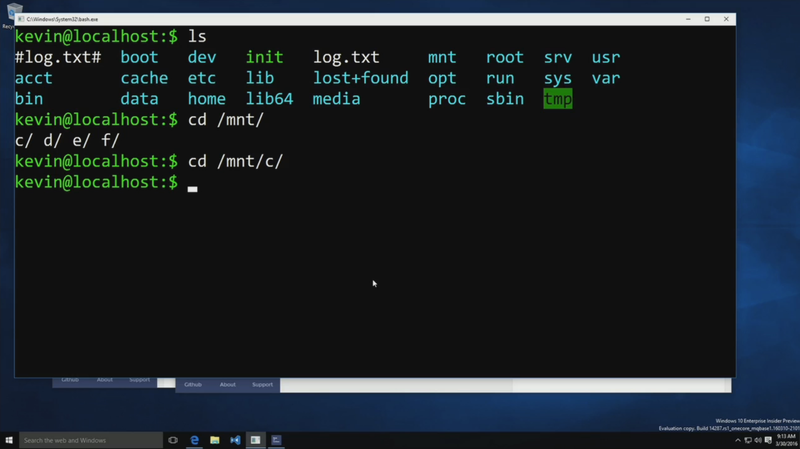 Microsoft surprised everybody with the announcement that it is bringing the Bash shell, a command line tool used in Unix-style operating systems like Linux, to Windows 10. FINALLY! Goodbye Cygwin :D.
Nice, now I can run some of those pen-testing tools from Kali under Windows 10. Delivered to your door, tomorrow April 1st. Only if the tool is written in Bash and doesn't have any other dependencies. This is just a shell. Rly? Had to be ubuntu helping MS get bash, a non-ubuntu made application, to windows? Pretty sure MS could do that themselfs. Ubuntu is bringing ubuntu to windows, with apt and a huge part of the ubuntu repositories available. Its not bash, its ubuntu they get. Thats what they said when they presented it. Only bash would never replace cygwin, but now ubuntu will. Well if that's the case that is indeed awesome. I just read the Lifehacker article, not the source presentation so wasn't aware of that. In any event, getting Linux software running on Windows 10 will require a compatability layer similar to Cygwin, unless each package has been posted to use native Windows calls. Should be great for Linux! Looks promising from the video. Still want to see SED and AWK in action. After that, chmod / chown / chgroup / su rely on using or changing permissions so they'd be interesting. Does bash "root" equate to windows "administrator" account? What about password / account management scripts?